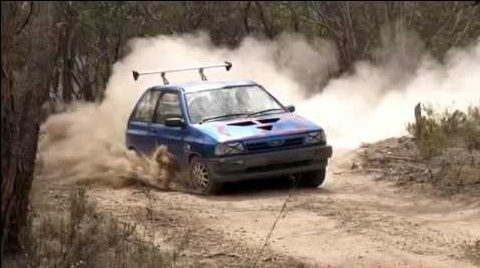 When we found this fine piece of video evidence depicting a couple of Australian lunatics performing stunts with a stock Ford Festiva, we couldn’t look away. Maybe second only to the spoiler on the hatch of the car is the driver’s wet suit. And of course the spoiler is the singular upgrade to the pair, named Skat and Wozza, added to the machine before performing their stunt. The task: Launch the Festiva off a regulation ramp and into a reservoir above a small dam somewhere in the outback, with the intention of landing in the middle of the water. And as if Australian law requires these tow to be holding their beers for the shoot, these two made sure to comply with an almost mandatory look on their faces. There’s just something about these two Maybe it’s the foreign mystique, but it suggest that Aussie rednecks are better than American rednecks. In fact, down there, these two would likely be called Bogans. And these two Bogans put together a video that make art out of the wonderful act setting up and jumping a Festiva into a pond at 80 km per hour. And the ramp, by the way, you’ll notice is high end. We most certainly did.